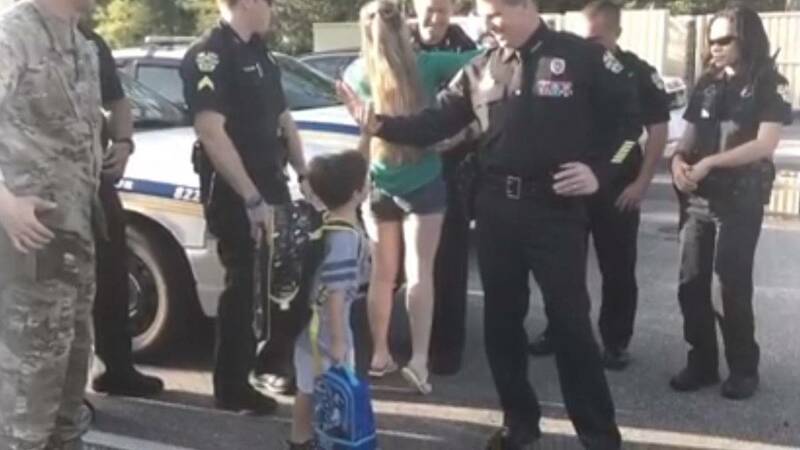 ORLANDO, Fla. - A group of Florida police officers escorted the son of their wounded comrade to his first day of kindergarten. Caleb’s father, Officer Kevin Valencia, was shot in the face in June while responding to a domestic violence call in which the suspect killed four children before taking his own life. Valencia is in a coma and is being treated in Atlanta. Orlando Police Chief John Mina said members of Valencia’s squad took Caleb and his mother to school Friday. Mina said it was an emotional day, but the boy was excited to show off his Lego Batman book bag. The Orlando Sentinel reports Caleb high-fived his mom before walking into the classroom as the officers stood by.